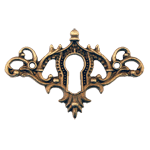 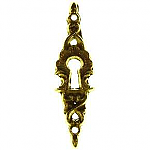 Keyhole Covers Is a keyhole on your vintage or antique cabinet or desk missing the keyhole cover or insert? 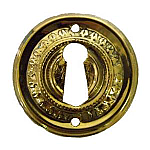 If so, you probably know how naked it can look without the right cover plate. 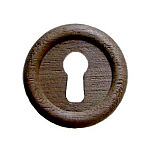 More than mere embellishments, keyhole covers can also help protect the wood at the edge of the keyhole and even help keep your skeleton key properly aligned on insertion. 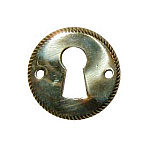 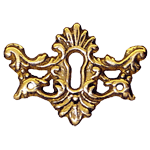 To dress up your vintage furniture's look and function, check out our broad assortment of antique reproduction keyhole covers. 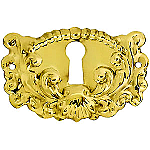 At Kennedy Hardware, we've got dozens of cover plates – with or without integrated drawer pulls – from simple round wood designs to ornate and elegant keyhole covers and escutcheons in a variety of classic materials. 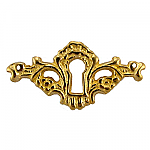 Check out our collection today. 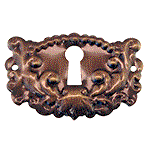 If you don't see a direct match for your existing antique furniture keyhole covers, consider replacing all the covers on your vintage furniture. 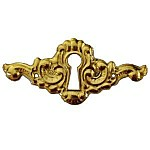 That way you can keep a classic style while making sure your cabinet or desk has an authentic and cohesive look.